Description: Hard on the heels of the return of her mother’s body from the frozen reaches of the Himalayas, Flavia, for her indiscretions, is banished from her home at Buckshaw and shipped across the ocean to Miss Bodycote’s Female Academy in Toronto, her mother’s alma mater, there to be inducted into a mysterious organization known as the Nide. 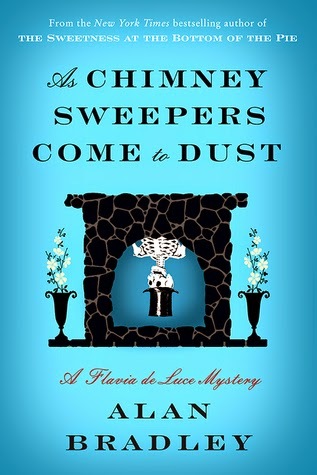 Another devilishly fun mystery with my favorite little scamp, Flavia. This time the little imp heads to Canada and hijinks ensue. Especially loved all the familiar mentions of Toronto places. "I could succeed at whatever I chose. I could, for instance, become an undertaker. Or a pathologist. A detective, a gravedigger, a tombstone maker, or even the world's greatest murderer. "By the end of the third shelf I had begun to see why librarians are sometimes able to achieve such pinnacles of crankiness: It's because they are in agony. If only publishers could be persuaded, I though, to stamp all book tiles horizontally instead of vertically, a great deal of unpleasantness could be avoided all round. Chiropractors and opticians would be out of business, librarians cheerier, and the world would be a better place."